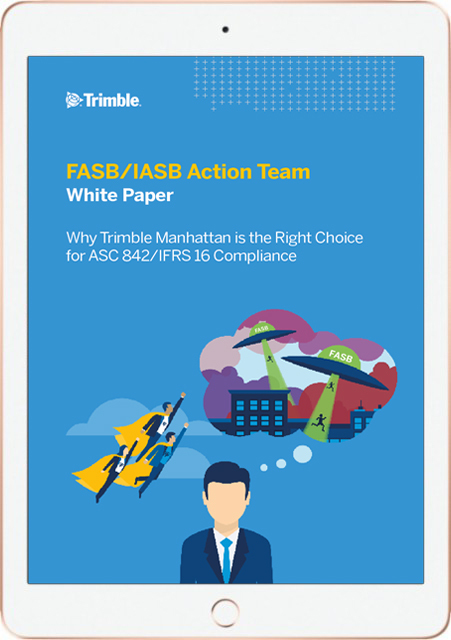 This is the third in a series of white papers that examine the likely impact of the new FASB & IFRS lease accounting standards. Download our guide to find out how the Manhattan system from Trimble is uniquely placed to ensure a smooth, risk-free transition to the new standards. The paper answers 6 top questions frequently asked by organizations affected by the lease accounting revolution. What does the Manhattan Compliance solution provide? How do I know Manhattan complies with the Standards? What differentiates Manhattan from other solutions? What reporting functions does Manhattan provide? How is Manhattan going to help me on Dec 15, 2018 or Jan 1, 2019?